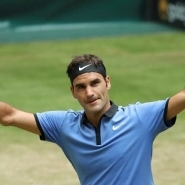 Roger Federer advanced to the Halle Open (Germany) semifinals after defeating defending champion Florian Mayer 6-3 and 6-4. With this victory, the Swiss improved to 8-0 over the German whom he had last beaten last year in Stuttgart 7-6 and 7-6. Federer, eight-time winner of this tournament, started the match by serving and winning the first game to take the lead. Mayer held his serve and tied Federer, but the Swiss went back up ahead again (2-1) with a dominating third game in which he led 40-0. The first break of the set came in the fourth game when Mayer made an unforced error and allowed Federer to take a 3-1 lead. Federer used his power to hold his serve and take a 4-1 lead only to see Mayer cut the lead to 4-2 after holding serve. In the seventh game Mayer pulled ahead 0-30, but failed to take advantage to break Federer. Instead the Swiss recovered and won to make it 5-2. Federer served in the ninth game and this time he didn’t let the opportunity pass as he used three aces to jump ahead 40-0 and win the first set 6-3. In the second set the defending champion tried to put up a fight and started by serving and winning the first game, but Federer made it one 1-1 as he kept Mayer from breaking his serve. Mayer and Federer then each held serve and won their games to make it 2-2, but Federer broke Mayer’s serve in the fifth game to take a 3-2 lead. Federer used that as a confidence boost and held his serve to make it 4-2. When it looked like Federer would cruise for the rest of the set Mayer came back by holding serve and making it 4-3 by denying three break points to Federer. Federer would use his serve to take a 5-3 lead after eight games, but in the following game he failed to take advantage of two match points and allowed Mayer to come back and hold serve to make it 5-4. Federer, determined to not let another chance go to waste once again made use of his powerful serve to win 6-4 and take the match 2-0 in an hour and seven minutes. The Swiss will now play Russian Karen Kachanov to try and reach his ninth Halle Open final. Kuchanov beat fellow Russian Andrey Rublev (7-6, 4-6 and 6-3) to reach the semifinals.